What is Examinare Survey Tool? 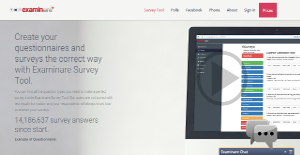 Examinare Survey Tool is an ideal application for sales and marketing professionals, product researchers, and other users looking for a data mining product to quickly create and conduct surveys both on the web and in the field. This survey tool helps businesses gather feedback from their consumers as well as determine the direct connection to their customers’ likes and dislikes. Examinare Survey Tools has been a part of over 14 million surveys and is widely used by businesses of varying types and sizes. With Examinare, creating, distributing, and analyzing surveys are simple and pleasant. The platform is extendable to various business applications, including Dropbox, Zendesk, and WooCommerce to name a few. Aside from fast and easy creation and administration of surveys, Examinare Survey Tool offers automatic, reporting, localization (it’s available in 25 languages), and SSL-encryption for tight data security. What Problems Will Examinare Survey Tool Solve? Scenario #1: Delivery company wants to know if client is happy with speed and quality of delivery service. They use Examinare Survey Tool’s Delivery Control feature, which integrates with their system and set up automatic survey sending to the customers who has been marked by the system as the ones who have received their order. Scenario #2: Ecommerce store owner wants to know if their customers are satisfied with their work and prices. They can either use Examinare Survey Tool and create a survey themselves which can then be put into their site or through pop-up window on their site. Or they can order Examinare Survey service with which the system can automate their feedback solution workflow similar to Delivery Control option. Scenario #3: Clinic owner wants to know if the patients are served the best way and happy with the treatment. He can use Examinare Survey Tool’s Clinic Evaluator solution and preload a survey on a tablet in a clinic and give to patients or send it to their email. If you are considering Examinare Survey Tool it might also be a good idea to examine other subcategories of Best Survey Software collected in our base of B2B software reviews. There are popular and widely used solutions in each software group. But are they necessarily the best fit for your enterprise’s unique requirements? A popular software solution may have thousands of subscribers, but does it offer what you need? For this reason, do not blindly spend on popular systems. Read at least a few Examinare Survey Tool reviews and mull over the factors that you wish to have in the software such as the fees, main features, available integrations etc. Then, choose a few solutions that fit your wants. Check out the free trials of these apps, read online comments, get information from the vendor, and do your homework meticulously. This exhaustive homework is certain to assist you select the finest software application for your organization’s special requirements. How Much Does Examinare Survey Tool Cost? We realize that when you make a decision to buy Survey Software it’s important not only to see how experts evaluate it in their reviews, but also to find out if the real people and companies that buy it are actually satisfied with the product. That’s why we’ve created our behavior-based Customer Satisfaction Algorithm™ that gathers customer reviews, comments and Examinare Survey Tool reviews across a wide range of social media sites. The data is then presented in an easy to digest form showing how many people had positive and negative experience with Examinare Survey Tool. With that information at hand you should be equipped to make an informed buying decision that you won’t regret. What are Examinare Survey Tool pricing details? What integrations are available for Examinare Survey Tool?